I thought I better set the record straight today and let you know that we did teach some classes while we were in Sydney. 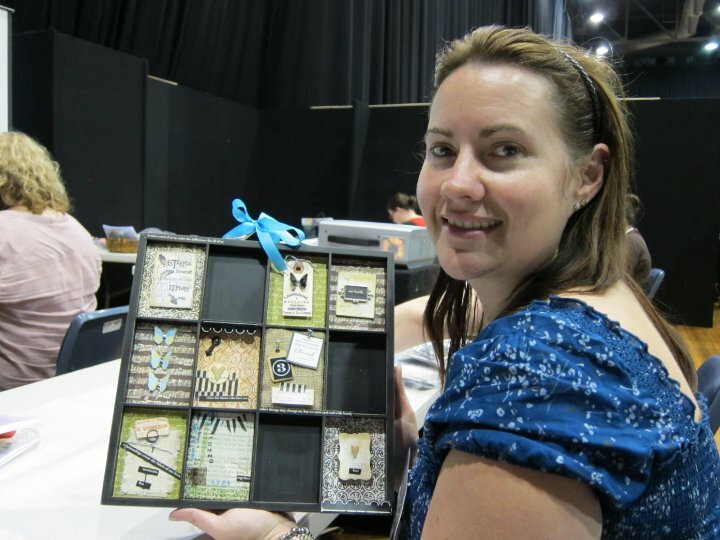 We started at the SIA Trade show that supports Australian and New Zealand retailers. 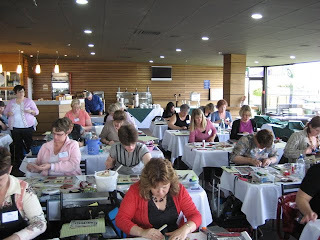 Deb and I taught a class using the 7gypsies Artist Printers tray. We were happy to see old friends from New Zealand; Tracey from The Stamping Ground in Chirstchurch and Karen from Inkspiration in Invercargill. There they were, right in the front row, just like old times! I say, anyone that endured the 4 ft Advent Calendar class we did that last trip is a true scrapper! Meet my soul sister Sarah Ward. I say that not because I know Sarah well but in all the years I have been teaching with Deb, Sarah is the only girl that has showed up to class with a rotary cutter as cutting device. A girl after my own heart...we have to stick together! 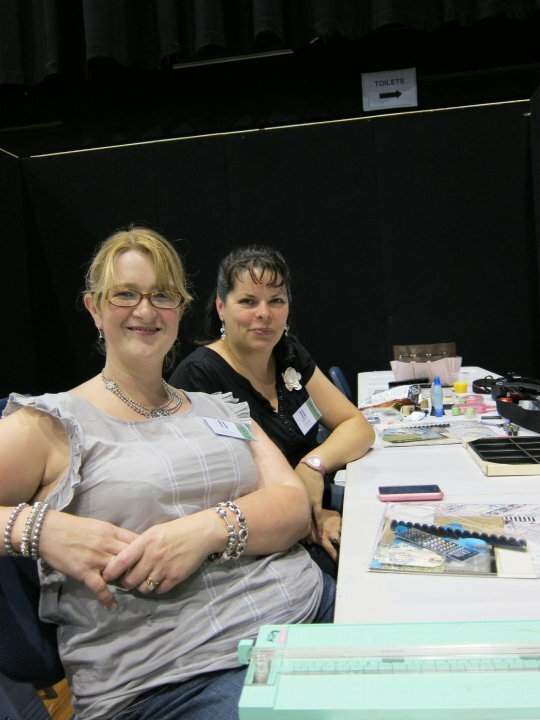 I had Deb snap this picture of us holding her Rotary cutter as proof. Yeh, Sarah! PS) she was a terrific student too. So if Sarah Ward is my soul mate maybe Tracey is Debbie's. Tracey paid something like $1000 for the clock Deb made for a charity auction. How generous is that? The money went to a charity that supports mothers and children with special needs. Thanks to all who made SIA possible! We really loved being there. Next, we will meet up with the fabulous Julie van Oosten and Audrey Underwood and take a look at what magic they cooked up for the SIA event. Total inspiration! It looks like a wonderful day ... I just wish I'd been able to get there. Ah well, I guess there's always next year. I spy a glue stick in the picture. Do you recommend them for adhering paper to printer trays and other of your projects? I am always "stuck" on what adhesive to work with. That project with the ATC tray looks so FUN! 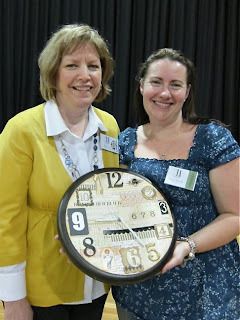 And Deb's clock - totally worth the $1000!!! The clock is FANTASTIC. I am lucky enough to Manage Tracey's store on the Central Coast of NSW, Aus. (Pages 2 Scrap, Tuggerah) And we get to admire that gorgeous creation every day. Love it.